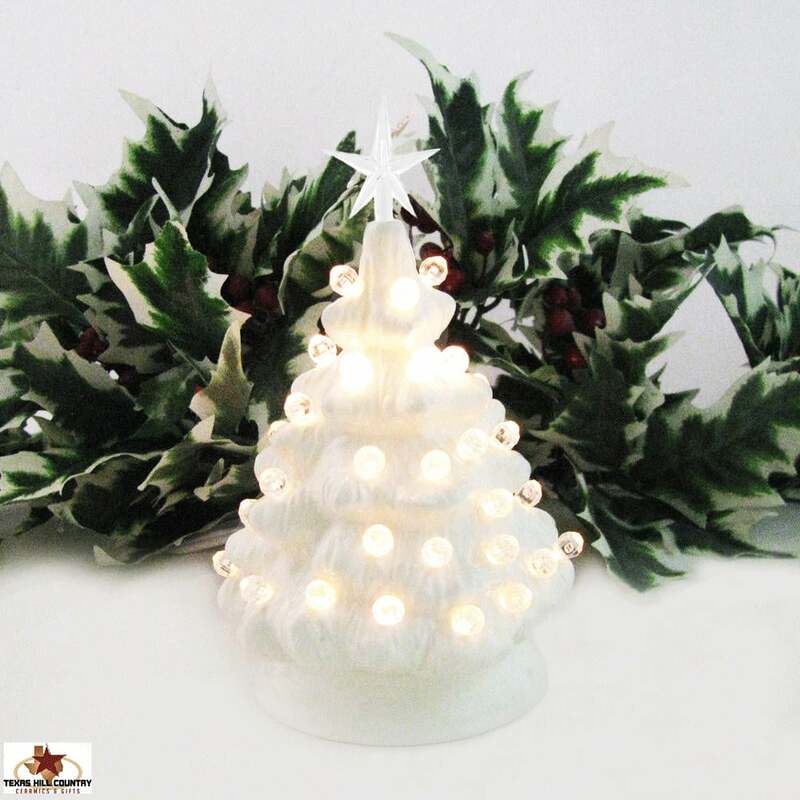 If you are dreaming of a white Christmas then this miniature white ceramic Christmas Tree with clear round lights and modern star is for you. This little tabletop electric lighted tree is another style I make, it is designed for the minimalist or for those with small limited spaces, great for those in a tiny home. This tree is 6 inches tall x 4 inches wide, and will easily sit on a narrow window sill, shelf, desk or entry hall table. This little tree can be used as a night light in a child’s room. This ceramic tree and electric base is finished in an opaque white glossy glaze. The round base is wired with a UL approved snap in light fixture and plug that is standard for electrical systems used the USA. On the cord is a rotating dial switch so you can leave it plugged in and switch your tree on whenever you want. A 6 watt light bulb is included. This tree is great for an office reception desk, corporate office cubies, nursing home residents, student dorm rooms or anywhere you want to add a bit of holiday cheer. My trees are crafted with a lot of care and love. I know it will last for many, many years to come. Ceramic Christmas Trees are a wonderful way to start a lasting tradition for you, your family and friends or to give as a gift to the hostess of that next seasonal Christmas party. This tree is a perfect size for my desk at work! I love this, it makes me think of my mom's old ceramic Christmas tree. Tree arrived quickly and is a nice night lamp. Very pretty, soft light. The cutest little tree. Can't wait to sit it on my desk to enhance my Christmas spirit while I work. Just adorable. Wonderful seller. Nice handmade ceramic tree, thanks so much! !